Our commitment to the Shell Recycling Alliance, developed by the Oyster Recovery Partnership, affords many ways to live our mission of sustainable practices at our catered weddings and special events. 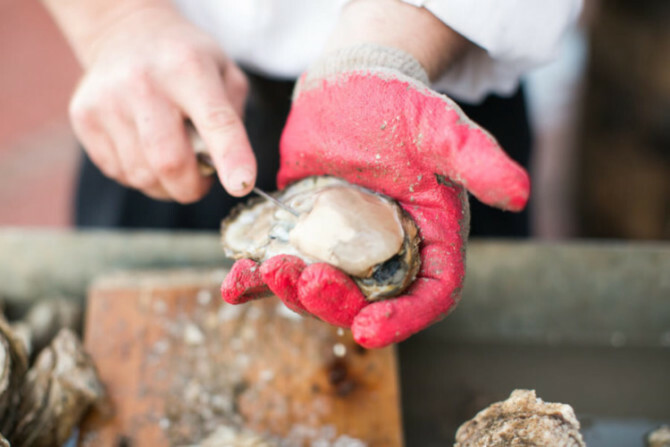 As spring approaches and more of our Baltimore catered events showcase Raw Oyster Bars, we are proud to help improve the Bay’s health by participating in the Oyster Shell Recycling Program. The Oyster Recovery Partnership (ORP) is a large-scale restoration program dedicated to planting disease-free oysters back into the Chesapeake Bay. As a result, nearly 5.9 billion oysters have been planted on 2,200 acres of oyster reefs and 70,000 bushels of shell have been recycled to provide homes for new oysters. Instead of throwing away hundreds of oysters from our events, we donate the shells to ORP, so that new oysters are raised and oyster reefs are restored. Every half shell that we donate, helps create a new home for 10 new oysters. Besides being a delicious appetizer, oysters directly help improve the Chesapeake Bay’s health. One oyster can filter up to 50 gallons of water a day. Oyster reefs filter the Bay’s water and provide habitat for other marine life, like our beloved Maryland blue crabs. We’re proud to be partnered with the ORP and help the Shell Recycling Alliance’s mission of, “no shell is left behind.” Collecting and recycling 26,000 bushels of oyster shells in 2015, the ORP is set to have an even better 2016 season. Be on the look out at our events for the ORP signs, and our oyster shucker’s adding the shells to the ORP recycling containers. We are thrilled to do our part for this phenomenal cause! Error: Error validating access token: Session has expired on Friday, 12-Apr-19 20:42:14 PDT. The current time is Thursday, 18-Apr-19 06:19:32 PDT.